Project Bundle Up is a Salvation Army program that has been helping Rochester's neediest children since 2001. Low-income, urban children participating in Project Bundle Up have a unique opportunity to receive new winter coats. It is also a community event where volunteers from many sectors can reach out to some of Rochester's poorest children. 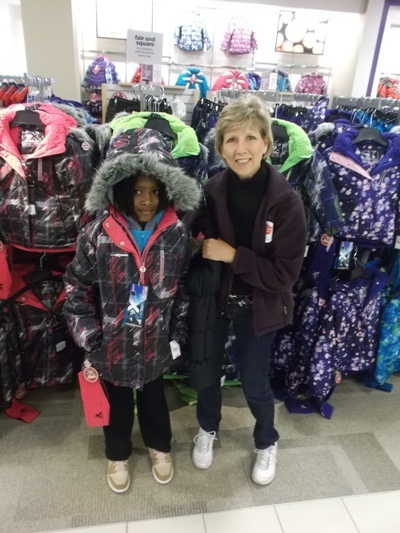 Project Bundle Up gives these children the opportunity to shop and choose a new, warm winter coat at JC Penney stores. Thank you to everyone who makes The Salvation Army's Project Bundle Up a success at the three local JC Penney stores. The program, funded through the JC Penney Company Fund, the Mary S. Mulligan Trust, M&T Bank and community donors provided new, warm coats to 364 children, who along with more than 250 community volunteers came out for shopping on beautiful Saturday morning. First Student Inc. provided bus transportation to and from the stores.